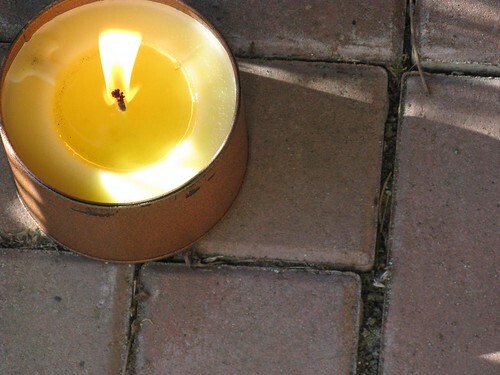 We were able to have dinner outside again last weekend, only by dint of rubbing ourselves with mosquito repellent wipes and setting citronella candles all around the perimeter of the patio. Even so, I got three bites on my feet and one on my hand. Blech. Still, it was nice to sit out in the yard and drink splendid rosé and eat halloumi, hot off the grill. If that’s not what summer’s all about, then I don’t know what is. Halloumi (for those who might be wondering) is a firm Greek cheese, a little salty, which crisps up without melting when grilled or sauteed. It must be eaten hot, and there’s nothing quite like it fresh off the grill. I first found mention of it in Nigella Lawson’s Forever Summer, and could immediately tell that it was something I would go for. Crispy cheese? I’m all over it. Amazingly, we’ve been able to buy halloumi from our regular grocery store, as well as the local co-op. Halloumi, I think, is best when it’s eaten with some sort of acid vegetable to cut the salt and dairy. 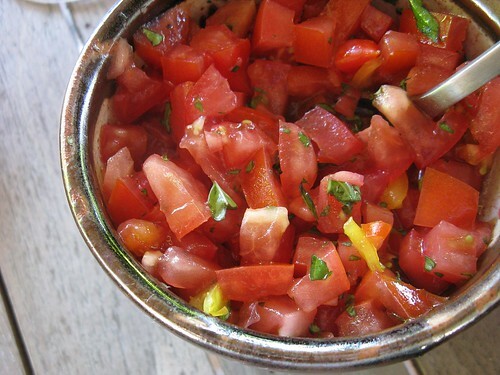 Tapenade, caponata or pickled peppers would be good, but so is a simple pile of fresh chopped tomatoes. This was a mix of regular red tomatoes from Hedlin Farm, enhanced by our first “Stupice” tomato and a little yellow pear tomato from our deck. I added a splash of good olive oil and some fresh chopped basil and it was lovely on the cheese. The mosquitoes did eventually drive us indoors, but it was fun while it lasted. We followed up the cheese with grilled lamb rubbed with cumin, very minty tabouli, and a batch of homemade coffee ice cream. Bliss! 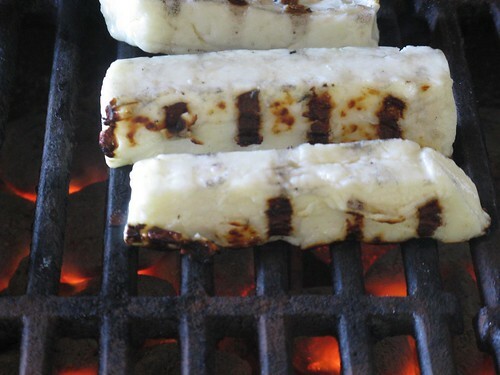 One of my favorite things about grilled halloumi is the texture. 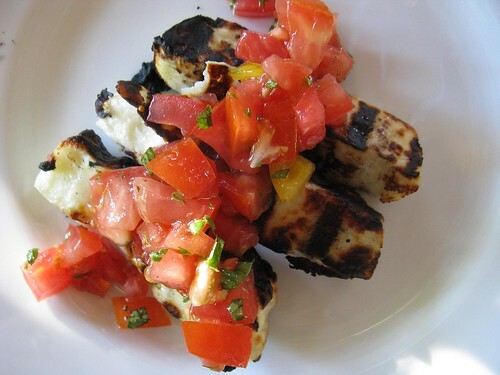 Halloumi squeaks against the teeth in the most peculiar way when you eat it, much the way that the sand on some beaches squeaks when you walk. I know that sounds odd, and not necessarily pleasant, but I think it’s awesome and a lot of fun. Just watched Jamie Oliver use that cheese. 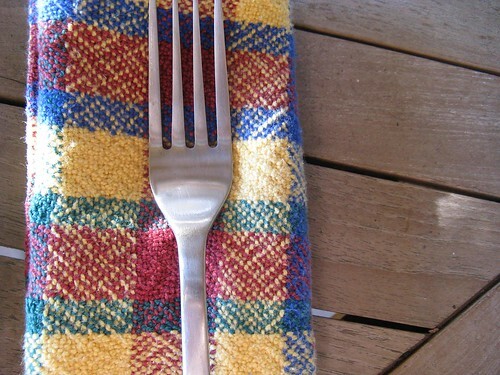 He pressed basil leaves into the cheese and pan fried the pieces to put into a strawberry salad. It looked great. Another item on the TODO list!